Gustave August Ficker's workshop produced a large volume of instruments, many of which were made to be sold by other companies. 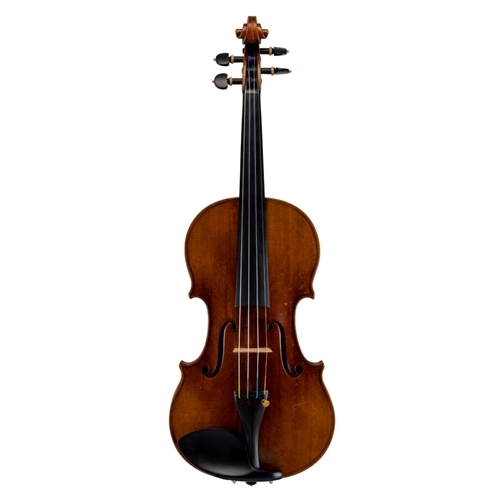 This violin is one of these, made for William Lewis & Son of Chicago, Illinois. The instrument is a fine example of early 20th Century German craftsmanship, with an excellent two piece book matched maple back, well figured ribs and neck, and even grained spruce top varnished with an attractive nut-brown varnish with hints of red over an amber ground. The boxwood-trimmed ebony fittings give this violin a classic and distinguished look. A brilliant, ringing projection and bright yet balanced tone make this an outstanding instrument for the soloist.